In a fit of boredom, I decided to marathon this low-stress, low-commitment drama. I have to give it some kudos, for the love story just zipped right along. One moment they were bickering, the next already on the path to dating. I guess Japanese dramas don't have the luxury of time that K or T ones do, and I actually really appreciate that. Thanks to this, they don't waste story space paddling around with filler material or side characters. Instead, the focus is maintained on our lead pair, who receive continual screentime and relationship development. While I'm still not enraptured by the story or characters, it was a fun, relaxing watch, with second leads that are actually realistic (with exception of the amusingly outlandish Fried Tofu / Takanabe) without swerving into angst land. Unfortunately, the drama is saddled with an insurmountable weakness - the leads lack even a teaspoon of chemistry with each other. Maybe the age gap has a role in this, but regardless, something doesn't look right when Kim Tae Hee stands next to Kouhei. This makes it incomprehensible how Yuna would fall for a plain Joe man so easily. There's also a lack of any meaningful story. We get it - bodyguard stays with star, the two fall in love and start dating, meet the standard complications, then end up happy together. The show literally proceeds right along this path, without daring to waver or add juiciness. The characters are also terribly flat. Aside from our Fried Tofu (who I still LOVE), nobody has any particular personality. Yuna is a nice girl, Kouhei is a nice guy, and the descriptions stop there. They don't feel complex or real, and that's a huge disappointment. Momo, Kouhei's sister, is also horribly annoying. I cringe at the thought of Taec ending up with her character. Rather than "nice" being her descriptor, "screechy" or "annoying as hell" come to mind. She yells every single line and always looks like she's smelling something bad. I'm guessing the actress was hired for her looks and dance ability (which are pretty standard, pop-princess type stuff) over her actual ability to emote. I mean, the two kids are even better than her! Poor Takanabe. I wouldn't have minded seeing him and KTH kiss, cause he's so pitifully adorable that you want to throw a bone at him. 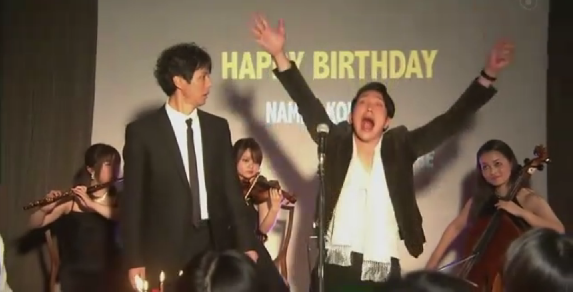 In fact, even him and Kouhei would've been better together - I mean the birthday scene! HAH.